10 minutes walk from the lake and the center of the village. The view of the lake and the mountains of the Annecy basin is very nice. Leisure activities and sports are numerous. 2 bedrooms (double beds), kitchenette (fridge, microwave, 2 induction hobs, toaster) bathroom in ground floor of the house with entrance (by the room), garden and terrace independent. No living room or dining room. Cot available. We live on the 1st floor with our children. Sheets, towels, mats, tea towels, sponge provided. French, English and Japanese fluent. 10 mins walk from the lake, and village. 15 mins from Annecy by car. Bus to city are available. First floor of an individual house, you can enjoy privacy with a separate garden and terrace. Wonderful view on the lake and surrounding mountains. Very quite neighborhood. 2 bedrooms with 2 queen beds, 4 people capacity + 1 baby bed available. 1 bathroom with 1 shower and 1 toilet. 1 kitchenette equipped with microwave, fridge, 2 induction plates and toaster. No living-room and not comfortable eating place inside. First floor of our house, we are at the second floor with our 2 kids. Bed sheets, towels, sponge, dishcloth provided. All renovated in July 2016. Fluent French, English and Japanese. Hi - my wife and I with our 2 boys stayed at Melanie's flat over Christmas for a week...it was very close to where my sisters apartment was. It is a nice flat, 2 bedrooms both with double beds and a very nice bathroom (always had hot water) great after a day's skiing in La Clusaz. I missed the fact that it did not have a lounge (my fault nothing to do with Melanie or description) but it was not an issue. Melanie and her husband were welcoming and when I raised issue with the radiators she resolved this and lent us some portable electric heaters which was fine. Thanks again Melanie...it was perfect. Melanie was so welcoming and friendly - we loved everything about the apartment - especially the lovely private gardens. We loved watching the rabbits and kitten run around - as did our two year old! We cycled to the lake beaches and Melanie recommended a local talloire restaurant 'savoyard' which was perfect for us. 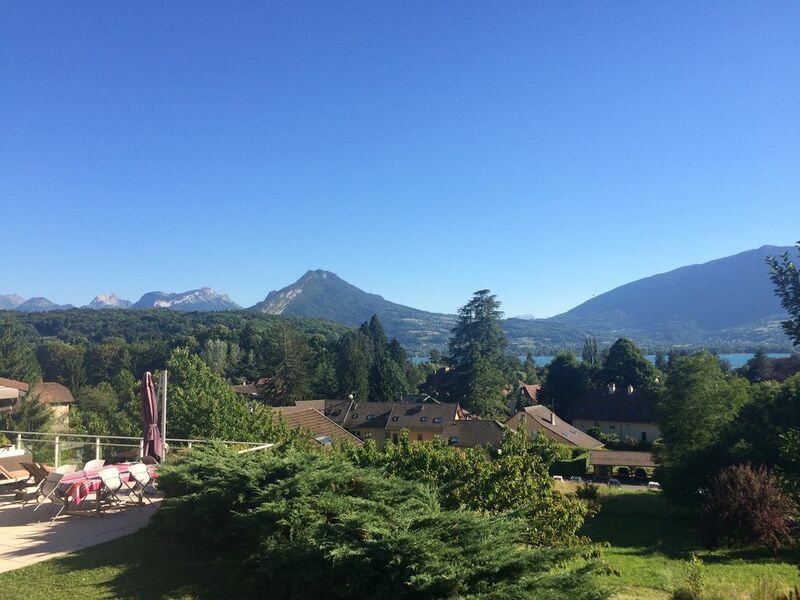 A fabulous second year stay in annecy - we will be back! We had an excellent stay at the apartment for 5 days. It had everything we needed and was very quiet and serene. We used it as a base for cycling and exploring the old town. We were very happy with the location being just far enough out of the main part of Annecy to escape the crowds but close enough to be in the midst of it all within 10-15 minutes. Parking was never a problem. Some nice villages on that side of the lake with good restaurants, bakeries, and shops. Already planning a trip back in the Spring and will stay here again! Un petit appartement tout neuf, avec deux vraies chambres, dans un coin tranquille avec vue sur lac, et un accueil chaleureux et serein. A recommander ! Les nombreuses photos sont conformes au lieu loués, le bailleur nous a très bien accueilli et a vraiment été disponibles et souple sur les horaires. En plus, lit parapluie, chaise haute a dispo pour ceux qui ont des enfants. Deux vrais chambres, une très belle salle de bain avec douche et une kitchenette, petite mais bien équipée. Extérieur a dispo avec vue sur le lac : idéal !